Situated on the banks of the Denmark River where the forest meets the sea, Denmark is without Question one of the States most beautiful towns. The Aboriginal name for the Denmark River is Koorabup, meaning 'place of the black swan'. Dr Thomas Braidwood Wilson explored the area in 1829 while his ship was being repaired at Albany. He named the river after a close friend and fellow naval physician, Dr Alexander Denmark. The tranquil Denmark River and the Esplanade with its beautiful trees and lawns make a charming area for picnicking, and for children to play. Barbecues are available on th eriver bank and there is an Apex childrens playground. There is a barbecue large enough for a function or coach load of visitors, covered by a large gazebo. The Mokare Heritage Trail is a walk/cycle trail that will take you on an easy three kilometre circuit around the bridges along the banks of the Denmark River through Karri and Peppermint trees. Denmark's popular appeal is based on its natural beauty, village atmosphere and year-round mild climate, providing a feast for the senses and an experience to soothe and enrich the soul. Imagine yourself surrounded by spectacular national parks, including the Valley of the Giants, where famous Tree Top Walk is to be found, and William Bay National Park with its inspiring coastal vistas. Stunning Greens Pool and nearby Madfish Bay offer safe swimming, and surfing and fishing beaches abound. Enjoy Denmark’s delightful premium wines with their distinct regional characteristics. Cellar door outlets offer range of other attractions also, including gardens, picnic areas, barbecue facilities and restaurants. Some people believe that there is an 'art magnet' in Denmark, because of the number and quality of artisans and galleries in the area. There are people working in just about every medium you can think of and you will be sure to find something unique and beautiful to take home as a reminder of your stay in beautiful Denmark. Where the forest meets the sea, in the heart of the Great Southern is a gateway to the tourist attractions - the Tree Top Walk in the Valley of the Giants. Spectacular coastline, forests, rolling green hills and the beautiful William Bay National Park. There are challenging or gentle coastal and forest walks, and intimate nooks and picnic spots. Activities including world-class wineries and vineyards, art galleries, animal touch farms, horse riding, great fishing and surfing, craft shops, antique shops, restaurants and cafes. Circular Pool, The Gap Peaceful Bay,Conspicuous Beach Lookout,Irwin Inlet Picnic Area,Peaceful Bay Public Reserve,Rame Head,Flag Hill Lookout Peaceful Bay,Walpole-Nornalup National Park,Nornalup Settlers Park,Sappers Bridge,Blue Holes,Nut Road Lookout,Bow Bridge Public Reserve,Valley of the Giants,WA's award-winning walk trail stretches 936.1kms from Perth hills to Albany,passing through the Valley Of The Giants region. First explored by Dr Thomas Braidwood Wilson of the British Royal Navy in 1829. The Wilson Inlet was named after him by Governor Stirling and Wilson named Denmark after a colleague, Dr Alexander Denmark. 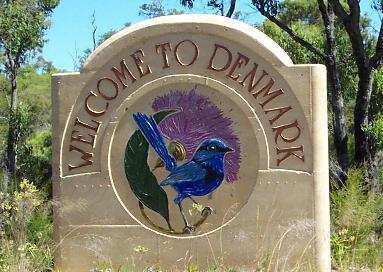 Denmark became established as a town in 1895 when Edwin and Charles Millar built a number of timber mills on the banks of the Denmark River to process the giant Karri trees which were felled inland and exported overseas. The town grew rapidly to handle the large labour force required to run the mills which, at their peak, were employing 750 men and producing 90 000 super feet of timber a day. At that rate of consumption the timber industry was short-lived and the mills closed in 1905. Only around 50 from 2000 people stayed on after the closures but in 1907 the WA government bought the entire town and set up a viable dairying industry by 1911. With a temperate climate, Denmark's weather is usually cool. The Summers here aren't very hot, in Winter the coast is affected by storms which bring much of the year's rainfall. The climate is very pleasant though, the town is slightly cooler than it's neighbour Albany. In Summer (December to February), the average maximum temperature is 25degC with an average minimum temperature of 12degC. In Winter (June to August), the average maximum temperature is 16degC with an average minimum temperature of 7degC. 40km from Denmark lies the world's longest and highest tree-top walkway at over 600m long and up to 40m high. The walkway gives a unique perspective into the forest canopy life as it meanders through the upper branches of these giant Tingle and Karri trees. The attraction has won international awards for innovation including the prestigious 2003 British Airways Tourism For Tomorrow Awards, beating 75 other international entries from 38 countries in the Environmental Experience category. Do not miss this one, whatever you do. This is a board walk that winds itself around (and sometimes through) the giant trees that give this forest it's name. There are plenty of retreats and stops along the way so that you may marvel at the grandeur and power of nature around you. This attraction is located at the same site as the Tree-Top Walk and is simply stunning and fantastic, rock and reef scenery encompasses Greens Pool a safe and tranquil swimming hole on the coastline of the William Bay National Park. Protected from the surf and safe for swimming and snorkelling, the water is almost completely transparent and has a beautiful turquoise green and blue colour. Close by are the Elephant Rocks, huge of boulders which look like a herd of elephants on the water's edge, a very unique sight and well worth a photo or two. The inlet that helps give Denmark it's character is, at 36 square kilometres, one of the biggest inlets on the south coast. It is ideal for fishing, windsurfing, boating and water skiing. Walking trails which include a heritage trail, are featured in various places around the inlet. You will marvel at the sight of hundreds of Black Swans gliding across the water. These native Australian birds seem to flock here all year this area will provide you with outstanding viewing areas.